Don't bury the western yet! As a member of the Danish avant-garde filmmaking collective Dogma 95 (a group which included Lars von Trier and Thomas Vinterberg) director Kristian Levring upheld a pure “vow of chastity” to make raw films based on story and character, rejecting technology, genre movies, and films that depend upon a reliance on killings, shooting, and explosions. Well, with his latest film, The Salvation, he kisses that manifesto goodbye. The Salvation, like a filmic Frankenstein’s monster, is an overheated western assembled from disparate elements of various classic westerns, Ford and Leone, Unforgiven, High Noon, A Fistful of Dollars, The Outlaw Josey Wales, even How the West Was Won, all reflected in the crazy mirror of The Salvation. And Levring even turns up the exaggeration level in an already overheated genre a few degrees higher. And yet in spite of the resultant otherworldly, out-of-kilter look to The Salvation, it is still surprising satisfying and effective. On hand for this revenge feast is Jonathan Pryce as the weak-willed town mayor and undertaker, Douglas Henshall as the ultra-rational sheriff (he tells Jon at one point, “Your death is going to buy us some time”), and Eva Green, the beautiful wife of Delarue’s brother, who had her face slashed and her tongue cut out by Indians, and does whatever she needs to do with her eyes. Green, in what must be an inside joke, appears throughout the film in a collection of green dresses. This supporting cast adds flavor to The Salvation and provide Jon with more of a reason to kill everyone in sight. Levring, working with cinematographer Jens Schlosser and special effects and CGI wizards, creates a Cezanne-like over-modulated look to the film – the daylight scenes are overly bright and saturated with color, the night scenes are darker and moodier, the rains come down in a horror show downpour – that turns The Salvation into a druggy nightmare landscape, centering upon Mikkelsen’s grim visage. 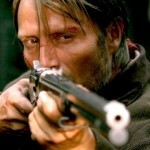 Mikklesen’s dead-eye look and determined wall-of-tenacity stance is the hook of the film, and the CGI swirls of corruption and venality are there for Mikkelsen to shoot away. Elemental westerns died in the United States when Eastwood hung up his spurs after Unforgiven. It is ironic that (of all things) a Danish western, directed by a recovered-genre hater, is one of the few effective westerns to emerge in the last 35 years. Levring puts the western through it’s tried and true (and clichéd) paces, but still manages to create a new way of seeing the old forms.